What’s Doug Landau’s JAM?! Helping fellow cyclists during the annual Reston Bike Club Century rides. Doug Landau signed himself up to help out during this popular Northern Virginia cycling event. Then, when he saw that his Keller Williams realtor wife (AKA “Melissa my Realtor”) would not have to be at an open house, he signed her up for the same provisions post. He thought it’d be romantic. Mrs. Landau was not impressed. However, more to her liking, the Landaus were able to ride around Loudoun County Virginia for two hours over some of her favorite roads before their shift started. During their time in the saddle they saw friends, other Reston Bike Club members and enjoyed a perfect day of sunshine, breezes and views. Climbing the hills of Stumptown and Taylorstown Roads in both directions, they could appreciate the efforts of the bikers who stopped in Lovettsville for refreshments, reloads, restrooms and stretching. 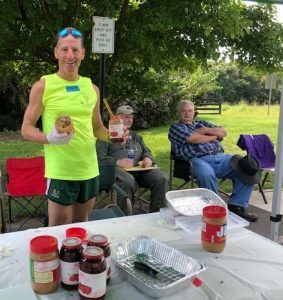 The Reston Bike Club’s rest stop in Lovettesville, in Western Loudoun County, Virginia, was staffed by volunteers with lots of experience cycling and working events like this. While Doug Landau was on his way back to the rest stop, going against the steady stream of riders working hard to get back to the Reston Town Center Pavilion, he noticed a cyclist stopped on the side of the road with his bike taken apart. Apparently this participant had sustained a flat tire. But with a spare tube, this young athlete repaired the wheel, but then could not re-attach his derailleur to the wheel of his Specialized bike. Instead of “quick release” axles, he had disc brakes on the front and back wheels which had screw-in axles. Landau stopped riding and was able to assist the rider put his bike back together and get back into the Century. Fortunately for both this young cycling enthusiast and Lawyer Landau, this incident occurred on a downhill portion of the route. If they had stopped on the ascents on Stumptown or Taylorstown, it would have been difficult to get momentum and speed. The only other “action” Landau saw during the day was a small laceration to a cyclist that was cleaned, bandaged and then sent on his way. A butterfly stitch would all that would be needed. No other major injuries or mishaps were noted during the Landaus’ shift. While Melissa Landau did NOT consider the Reston Century to be a romantic “date,” she did enjoy assisting cyclists and the other volunteers at Loudoun County’s Lovettesville stop with food, directions, fluids and heavy lifting putting everything away. Leftover food and supplies were donated to local charities. The Reston Bicycle Club Century ride had over 1,000 registrants, with more than half opting to take on the full Century (over 100 miles of bicycle riding!). 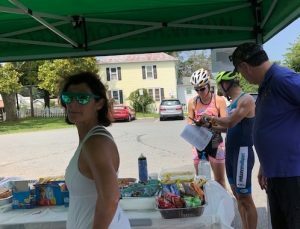 This year the ride organizers minimized use of the W&OD Trail, and the rides even took cyclists past the Landau’s friends at the Transition Triathlon Store in Leesburg. In fact, Melissa and Doug stopped by this store on their way home to buy Melissa a pair of Newton running shoes, as they have all of the latest Triathlon and Multisport gear and the shop is conveniently located just off the W&OD Trail & Catoctin Circle. While shopping, the Herndon bike injury lawyer saw several century riders come in for fluids, food and facilities. The Landaus have ridden the Half Century and the Metric Century in prior years. The rides take bikers through portions of Fairfax and Loudoun counties and had cookies donated by Great Harvest Bakery. While century riders can start as early as 6:30 AM, other riders doing shorter distances could set out later. All of the routes start and finished at Reston Town Center, where more treats, goodies and entertainment awaited participants. 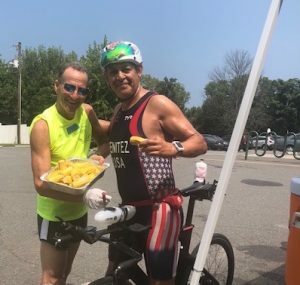 Top area long distance triathlete Lester Benitez stopped by the rest stop in his TeamUSA kit. He & Lawyer Landau compared notes about family, recent races, Landau’s fruit slicing skills & future competitions! The Reston Bike Club has rides during the week as well as on weekends. You can usually find the Landaus riding with the Tuesday evening group rides at Hunters Woods Shopping Center and, more frequently, on Thursday evenings. The Thursday night group rides can be seen leaving from the Herndon Municipal Parking lot across from the ArtSpace, just 100 yards down Center Street from the Abrams Landau law office! There are 5-6 levels, from the speedsters in Group 1 to the more social riding of Group 5. 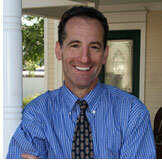 Doug Landau rides with the 3s, the 4s and sometimes the 2s and 5s. Melissa enjoys a group of 5s who look out for each other and sometimes go out for “Taco Tuesday” at Glory Days in Fox Mill Shopping Center after a ride. If you like to ride and want the safety and camaraderie of riding with others who ride at your speed and distance, reach out to the Reston Bike Club. With a renewed emphasis on responsible biking, the ride leaders and officers of this local club are to be commended.